Whilst there exists several species of wasps in New Zealand, two common species found in the Kapiti coast region include the ‘Common Wasp’ and the ‘German Wasp’. Neither is native to New Zealand. The sharks of the insect world, wasps are ferocious predators and will attack anything especially if they are provoked, in defence of their nest or if they sense a protein rich meal. Honey-dew, a sweet insect by-product and an essential source of food for native birds and insects, its also a favourite energy food source for wasps. Their peculiar taste for honey-dew highlights the potential to rob some of New Zealand’s native species of a valuable food source, and give wasps the serious potential to be able to change the species composition of an ecosystem. More recently giant willow aphids, a very recent invader causes masses of wasps to congregate around willows, feeding off the honey-dew secreted by the sap sucking aphids. Chinese paper wasp (Polistes chinensis) nest. Most wasps build nests in the ground or under overhanging eaves of houses, and under branches or roof voids such as attic spaces in buildings. It is estimated that over the summer months one in three residential properties will contain a wasp nest and if left unchecked wasp populations can rapidly increase. (i) Approach the nest from a side angle, DO NOT APPROACH front on, you will be in the flight path of the wasps entering and exiting the nest. (ii) Choose your time to approach, wasps are less active during early morning or evening, and when air temperatures are cooler. (iii) Wasps are attracted to white light. At night, use a torch, covered with red cellophane over the light source. 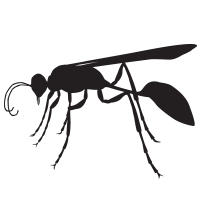 (iv) Wasps are extremely sensitive and capable of detecting any movement. Most importantly if you run - they will follow. German wasp (Vespula germanica) nest. A dangerous thing - do not attempt to destroy on your own. We recommend you don’t approach wasps or their nest. If disturbed, wasps will quickly become aggressive, they can sting repetitively and for some people stings can result in a severe allergic reaction. Instead, contact us at Nature’s Way. We use specialised knowledge on how to deal with wasps and their nests quickly and efficiently, and when the wasps have been destroyed we will remove them (and the nest) from your residence. We are Vespex approved users. Honey bee (Apis melifera) swarm. If you find a bee swarm or a bumble bees nest and want them removed we can do this as well. Contact us at Nature's Way.